The weekend two weeks ago was very rainy and grey, and after a exhausting week in the lab I was in a really bad mood. But instead of staring out of window and asking myself where the summer has gone I decided to do something that cheers me up. Baking something is always good to brighten me up and it is my favourite cure against stress and and bad moods. 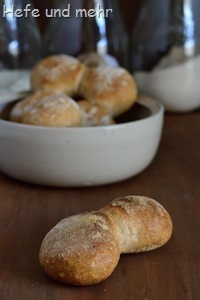 To knead a dough, to feel how it develops and becomes soft and silky, to see how the dough slowly rise and to smell how the tempting aromas fill the house when it bakes in the oven relaxes me and make me happy again. 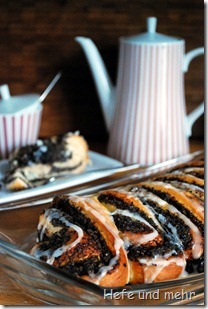 This time I decided to bake a Mohnstriezel (Poppy seed braid). Because the taste of poppy seeds alone in the filling can be overpowering I decided to mix the grounded poppy seeds with semolina pudding which I flavoured with some lemon peel. And because its sometime boring to use always the same form for this kind of bread I did a variation and cut the filled dough halfway in slices and fan them a little bit. 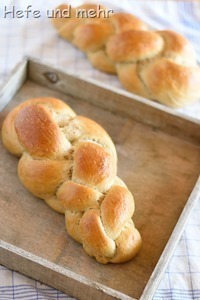 This looks very attractive and taste so good! While dough is fermenting prepare the filling: Bring water to boil and stir in the grounded poppy seeds, semolina and sugar. Stir the mixture until its starts to bubble. Now set aside to cool down. After cooling down to room temperature add the vanilla essence, dried bread crumbs and egg white to the filling. Using your dough scrapper make seven cuts on its long side up to 2/3 of the roll. Fan the slices slightly to make it lay flatter. Mix powered sugar and citron juice and glace the Striezel after they cooled down. 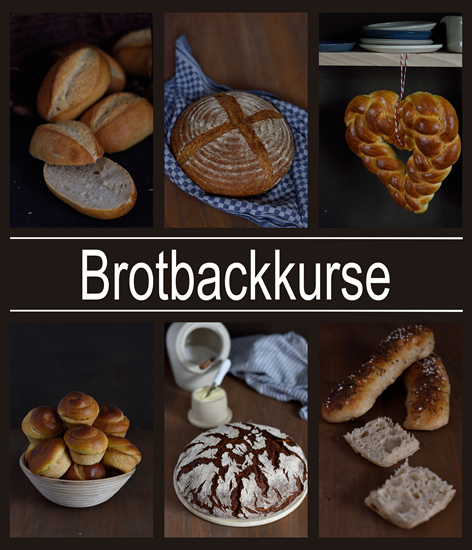 Viele schöne Brote kann man bei Susans wöchentlichen Yeastspotting sehen! ich hab noch eine Frage zur Füllung: kommt das Eiweiß einfach so oder steif geschlagen dazu? @Monika: Das Eiweiß kommt einfach so in die Füllung. 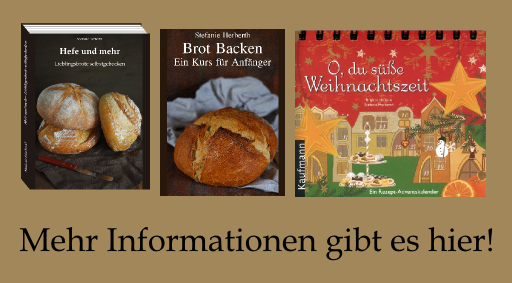 Hallo, wofür werden eigentlich die Semmelbrösel benötigt und wann werden sie zugegeben?Ich kann in dem Rezept leider nicht finden ob sie auf den Boden gestreut werden oder ob sie in die Füllung gegeben werden. @Rene: stimmt, die Semmelbrösel sind irgendwie aus der Beschreibung verschwunden. Sie kommen mit dem Eiweiß zusammenin die Füllung. Ich habe es korrigiert! Dann hab ich es ja instinktive richrig gemacht! 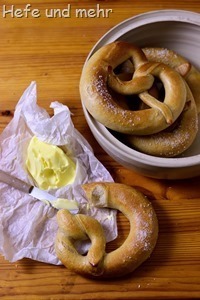 🙂 Danke für die schnelle Antwort.Habe die beiden Striezel vor zwei Stunden aus dem Ofen geholt und jetzt mit meiner Frau probiert!Sind sehr lecker geworden!Danke für das Tolle Rezept! Der Mohnstriezel sieht aus wie aus dem Backbuch, sehr hübsch. ich liiiiiiiiiebe Mohn!